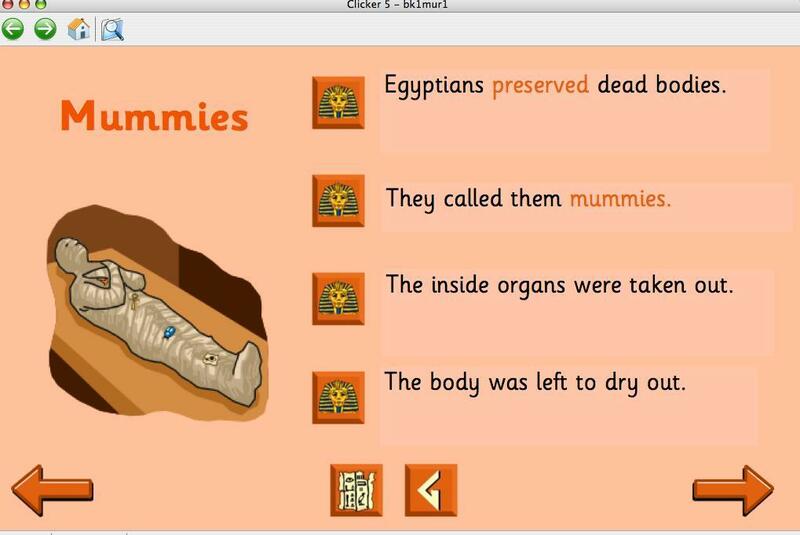 Clicker is the proven reading and writing tool that helps pupils of all abilities to achieve success in reading and writing. Clicker is used on over half a million school computers and in over 90% of UK primary schools. It is a fantastic resource, although the talking word processor aspect has now been superseded by WordTalk. However, in my experience Clicker is rarely utilised very much at all in classrooms. Why is this? Well, either teachers are uninterested in supporting their reluctant readers and writers or the software is not user friendly. I don’t think it’s hard to choose which of these options is the most likely. I have taught many children to access Clicker 5. Sometimes this has been relatively successful. Children can produce pieces of work that are largely coherent, well presented and illustrated without having to spell. 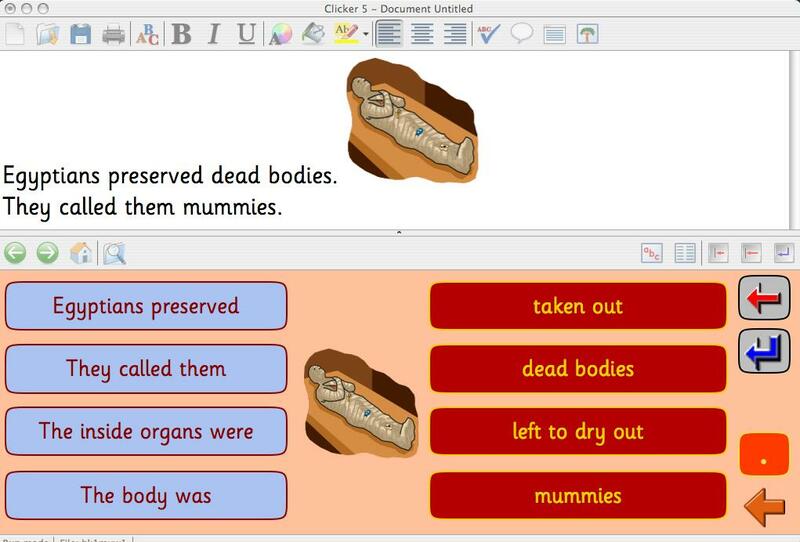 It is unusual, though, for the use of Clicker 5 to become a central component of classroom activity independently. I located a ‘Find Out and Write About’ disc that I thought would solve all my planning problems. And, indeed, it is a lovely resource with 3 levels of difficulty, interesting information and clear illustrations. Unfortunately, there is only one copy. So I did what all of us do, improvised. I borrowed the information – why re-invent the wheel? – to create grids for the children to work on in pairs. I have made many grids over the years but each time I have to re-learn the process. As I, like all teachers, have little time to prepare resources the grids turned out to be less user-friendly than I’d hoped. I spent most of the first session sorting out the blips. That is, once we had managed to open the software. Just the admin involved took most of the initial lesson: turning the laptops on once they had been located; searching for someone who knew the logins after refreshment; helping little ones type passwords. Following sessions were a whirlwind of activity with both myself and the support for learning teacher (who gave up her precious preparation time to help me) running between 3 pairs of children helping them to produce at most 8 lines of text. Yes, you read that correctly: 2 very experienced teachers working with 6 7 year olds became frazzled and frantic in five 45 minute sessions! This is just not practicable in a busy classroom. Differentiating work is essential of course, but when the energy required in providing support far outstrips the end result we have to question whether it’s worthwhile. I shall still use Clicker 5. The ‘Find Out and Write About’ and Talking Books software are terrific and can be used with small groups to enable them to access stories and produce a considerable amount of writing without having the drawback of poor secretarial skills hindering the process. I will also continue to recommend accessing extant grids available on learninggrids.com. Many teachers contribute their work to this site and they can be incredibly useful. But I shall be much charier about recommending its use as a resource for class teachers to implement alone. It’s just not possible. I’d welcome comments on this, colleagues. In my personal blog I have summarised a research study on the use of audiobooks with learners with dyslexia here but I wanted to post the abstract here also in case others hadn’t seen it. The paper confirms what we knew already, which is comforting. The objective of the research study was to understand what benefits the use of audiobooks (both school-books and books of various genres, recorded on digital media) could bring to preadolescents and adolescents with developmental dyslexia. Two groups, each consisting of 20 adolescents, were compared. The experimental group used the audiobooks, while the control group continued to use normal books. After 5 months of experimental training, the experimental group showed a significant improvement in reading accuracy, with reduced unease and emotional-behavioural disorders, as well as an improvement in school performance and a greater motivation and involvement in school activities. Interesting use of the word ‘normal’ to describe printed matter. It’s a generational thing perhaps. You can access the study by paying a fee. Anybody really interested is welcome to look at my copy. The Scottish Government announced yesterday that a new initiative in teacher training – the National Framework for Inclusion – aims to ensure better classroom support for pupils with additional needs, such as dyslexia. Cabinet Secretary for Education and Lifelong Learning Fiona Hyslop launched the Framework which offers advice to encourage student teachers and qualified teachers to be inclusive in their teaching. The Framework was funded by the Scottish Government and developed by the Scottish Teacher Education Committee (STEC), the body for the seven Scottish universities who provide teacher training.identifies the values and beliefs, professional knowledge and understanding and the skills and abilities, in terms of inclusive education, to be expected of both student teachers and qualified teachers. A further web-based resource will give support by providing relevant, high quality materials and documentation. The document proposes under each of the headings (Student Teachers, Teachers, Advanced Professionals) what should be regarded as minimum expectations of teachers at each of the levels rather than as a hierarchical approach to anticipated engagement by teachers. It aims to place a clear emphasis on the essential role played by the values and beliefs (Professional Values and Commitment) of each teacher in their commitment to the development of inclusive practice. The Framework Document aims to be comprehensive but not prescriptive. It is question-based to encourage teachers to accept a shared responsibility for researching answers – and further questions – with the support of the web-based repository. It would be good to see staff in schools thinking about these questions in relation to all their pupils. A new musical instrument, unofficially called the “skoog” and shaped like a toddler’s toy cube, has been invented for children with special needs by a team based at Edinburgh University. The researchers claim the technology marks a world-first in its ability to give disabled children – or adults – real power of expression in their music-making. Now that the prototype has been developed, a company, with the support of Scottish Enterprise, will to be set up to bring it to the commercial market. Skoog’s public launch is expected to take place at a Tapestry conference at Glasgow’s Kelvingrove Art Gallery and Museum in May, when 1,000 children will perform music on an Afro-Scottish theme, led by pupils from Hillside and Park special schools in East Ayrshire.